Posted by Mrs Weird Scientist in Evolution, Genetics, Human Body, Think About It. We can give thanks to chance that we don’t have the heavily browed foreheads of our Neanderthal relatives. Any guesses why that is? Read on to find out! Since modern humans and Neanderthals became isolated from one another – approximately half a million years ago – lots of changes have occurred and the two have mostly gone their separate ways, genetically speaking. Given that scientists are such curious and meddling creatures, they are constantly investigating how these changes happen and they continue to search (and argue!) for the reasoning behind it all. A new study published in the Journal of Human Evolution has shed some light on the skull differences between modern humans and Neanderthals. The conclusion? Good, old chance. Pun fully intended. Timothy Weaver of the University of California, Davis, and his research team analyzed a lot of skulls! They compared 37 measurements of modern human skulls with Neanderthal skulls and calculated the mean divergence, which is just the average difference between the measurements. Next, they took a separate sample of modern human skulls, compared those 37 measurements within the sample, and calculated the mean divergence. Finally, they contrasted their two calculations to figure it all out. The researchers’ conclusion? 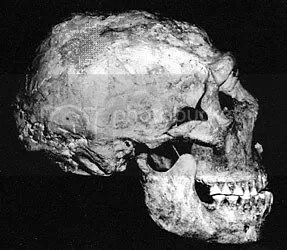 Genetic drift is responsible for the skull differences, not positive natural selection. With positive natural selection, certain traits get carried on from one generation to the next as a response to changes in the environment. Genetic drift is different though. With genetic drift, physical features just randomly change. There’s no environmental driving force like you would see with positive natural selection. Credit: All images by Encyclopaedia Britannica. The picture at the very top shows a Neanderthal skull. The one directly above depicts the same, but also shows the skeleton of a modern human leering in the background! 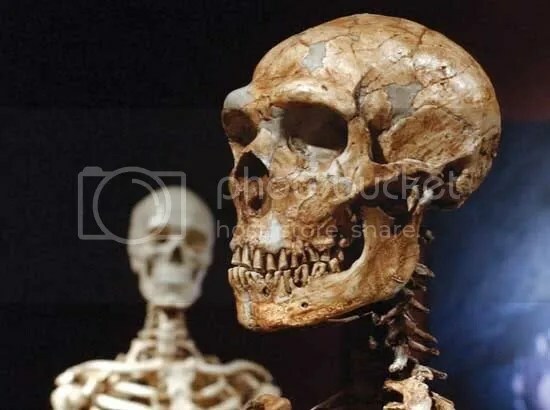 In the past, researchers had thought that these particular cranial differences were due to natural selection that occurred for other reasons, such as Neanderthals’ use of teeth as tools! Also, anthropologists had considered that modern human speech drove the changes. According to Weaver, it’s the development of culture that’s responsible for subduing the environment’s effect on Neanderthals and modern humans. It’s probably not so much a case of one or the other – positive natural selection or genetic drift – it’s likely a combination of the two in varying degrees. With positive natural selection less dominant, it’s again more likely that the cranial differences are due to genetic drift. So ultimately, what he’s saying is that modern humans can chalk up their dashing good looks to chance!